In the present course dedicated to minors, the participants will show us, in a schematic and very clearly way, the legal approach concerning the treatment that the respective States give the child, both in the field of protection, as in the one of the criminal responsibility for the commission of a crime or misdemeanor. Under this view of comparative law, there is the opportunity to meet the criminal procedure applied to children in conflict with the law, the age group from which criminal responsibility is required, the specialization of all the professionals involved from judges, prosecutors, lawyers, police, etc., involved in the area of the minor concerning the adversarial principle or the procedural guarantees for juvenile offenders. Regarding the enforcement of judicial measures, the central axis is education and the socialization of teenagers. However, each country has its own uniqueness and, in custodial measures, the age and type of crime are important in some countries. 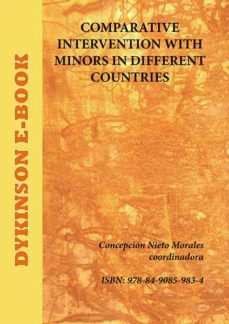 The part concerning extrajudicial solutions is highly informative, especially the part related to the Institute of mediation, where the participation of the victim is essential. I hope that reading and participation arouse in you the enthusiasm for me experienced, and that the efforts of its participants will be compensated with the learning and sensitization in the treatment of the child... Ana Mª Hermosa Martinez. Prosecutor of the High Court of Andalusia. Section Coordinator. Territorial of Seville. Spain.